In the mid-1640s, the colony of New Sweden was almost evicted by the Lenapes because of the colonists’ lack of trade goods and the mismanagement of the colony by their governor, Johan Printz. 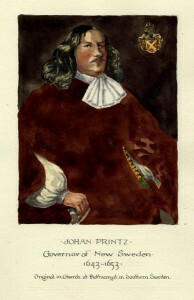 Printz had served the Swedish military in the Thirty Years War before Queen Christina appointed him the third governor of New Sweden. Printz initially led the colony to prosperity by doubling its population, increasing trade with the Lenape, constructing Fort Nya Elfsborg, and shifting the center of the New Sweden colony to Fort New Gothenburg on Tinicum Island. By 1647, Printz could not keep up with the Dutch competitive expansion in the area and he did not have enough goods to trade the Lenape for furs. War with Denmark prevented Sweden from sending additional settlers or items to New Sweden for about six years, which led residents to desert the colony for English colonies in Maryland and Virginia. Some colonists who remained in New Sweden were critical of Printz's leadership, and twenty-one eventually signed a petition accusing him of exceeding his powers as governor. Printz arrested the leader of the petitioners and executed him for attempting to cause a revolt. Members of New Sweden continued to criticize Printz's actions, and he resigned from his governorship in 1653. Captain John Montresor was a military engineer for the British when he was assigned in 1771 to design fortifications for Mud Island to protect Philadelphia and ports farther north on the Delaware River. Montresor, born in Gibraltar, learned engineering practices by working as an apprentice to his father, who served as a chief engineer in the British military. 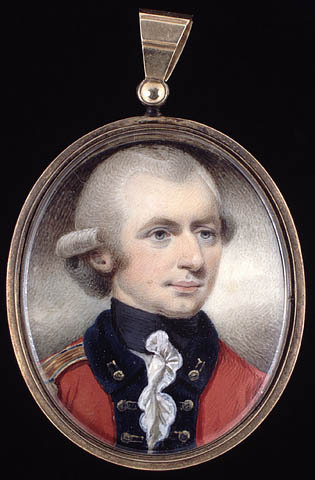 The 1775 miniature painting of a British officer shown here is identified in the collection of Library and Archives Canada as "possibly" Montresor. Montresor came to America during the Seven Years' War, where his work through several campaigns earned him the rank of captain and chief barrack-master of the ordnance for America. Six designs were developed by Montresor for Mud Island, but limited funding from the British and the Pennsylvania Assembly meant that even the least-expensive option was too costly, and only the eastern and southern walls of the fort were completed before Montresor left the project in 1772. 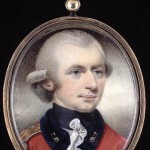 During the British occupation of Philadelphia in 1777, Montresor, then chief engineer of the British military, helped attack and destroy the American-controlled Mud Island fort. Mud Island was one of several small islands in the Delaware River, southwest of Philadelphia, that had marshy land, was prone to flooding, and had shifting landscapes owing to the tides and seasonal water levels. 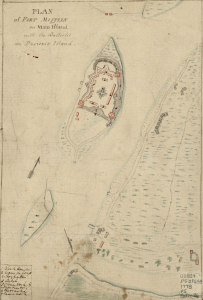 The small amount of usable land prevented farmers or other commercial businesses from using the island, but the Pennsylvania Assembly and the British military saw Mud Island as a decent location for defense fortifications. 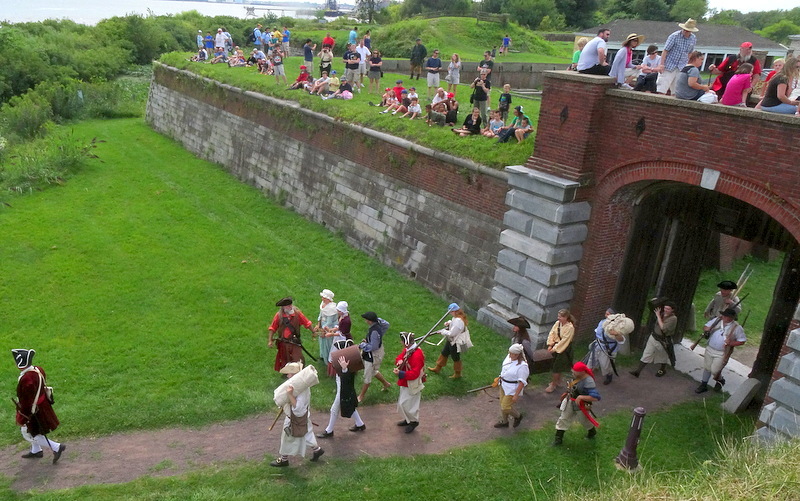 British military engineer John Montresor began constructing Mud Island Fort (later Fort Mifflin) in 1771, but financial issues prevented its completion. 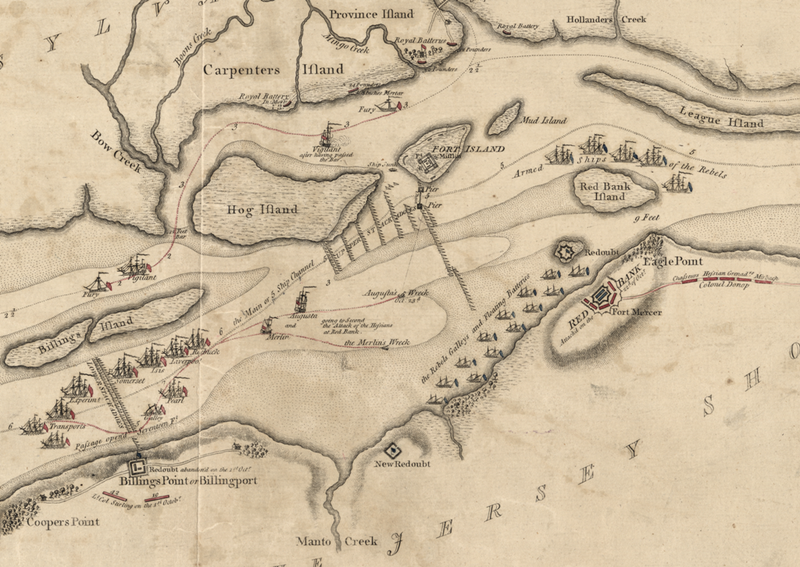 This map of Mud Island was drawn in 1788 and shows the incomplete walls of the fort, building locations, and the tidelands that cover part of the island. By the twentieth century, the landscape around Mud Island began to change shape as dredge spoils from the Delaware River were loaded onto nearby Hog, Carpenters, and Province Islands. In the 1930s, the development of the Philadelphia Municipal Airport required more dredge spoils to flatten and expand the land, connecting Mud Island to the mainland. As naval weaponry strength increased in the early nineteenth century, forts close to major ports or industrial centers were not viewed as effective defenses. The federal government ordered the construction of a new fort on Pea Patch Island, closer to Delaware Bay, which could provide adequate protection to Philadelphia and other manufacturing cities such as Chester, Pennsylvania, and Wilmington, Delaware. Construction started on the initial Fort Delaware after the War of 1812, but it was never completed because of a fire in 1831. Construction of a second Fort Delaware, with a different design and constructed primarily from brick and stone, started in 1833. The development of Fort DuPont and Fort Mott on the nearby coasts of, respectively, Delaware and New Jersey in the later nineteenth century made Fort Delaware part of a "defensive triangle" protecting the upper Delaware River from attack. This aerial view of Fort Delaware from 1944 shows the fort before it was decommissioned after World War II and given to the state of Delaware in 1947. Today it is part of Fort Delaware State Park, accessible by ferry from Delaware City. Facing east towards the Atlantic Ocean, this twelve-inch gun battery at Fort Miles was one of the defenses used to protect the entrance of the Delaware Bay from enemy ships. 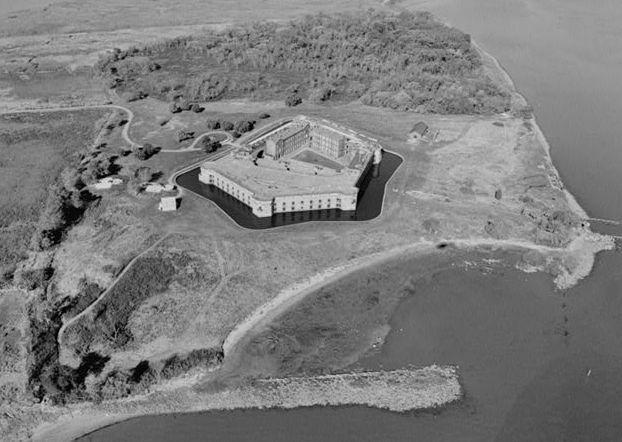 The federal government commissioned Fort Miles in 1934 as part of a larger effort to defend the eastern coastline from German U-boats, which military forts farther up the Delaware River could not deter. In addition to single-story buildings for soldiers and supplies, Fort Miles had four-story-high control towers constructed nearby to spot and determine the position of potential threats. 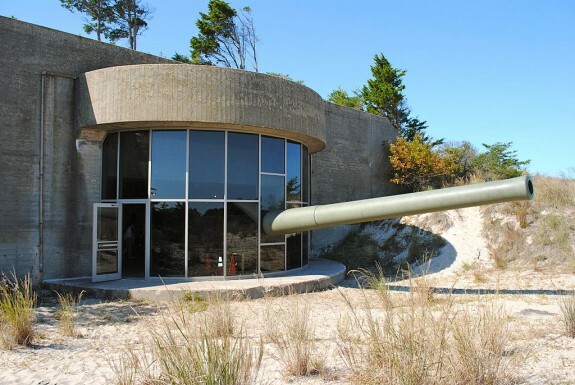 When Fort Miles opened near Lewes, Delaware, in 1941, it was equipped with a variety of long-range weaponry that could pierce a ship's armor plating from thousands of feet away. Restoration efforts in the early twenty-first century opened sections of Fort Miles, including this gun block, to the public. Constructed from the seventeenth through the mid-twentieth century, defensive fortifications along the lower Delaware River and bay guarded the region during times of international and sectional upheaval. As important structures with such long histories, forts help to explain the political, economic, and social history of the Greater Philadelphia region. The earliest fortifications in the lower Delaware region resulted from the intense economic colonial rivalries and wars of the early seventeenth century, as Dutch, Swedish, and English Protestant capitalist states battled Spanish, Portuguese, and French Catholic kingdoms for control of the North American and West Indian trade and settlement. Their rivalry led to construction of Fort Nassau, built in 1626 by the Dutch West India Company on the east bank of the Delaware (the future site of Gloucester City, New Jersey), and Fort Christina, built in 1638 by the New Sweden Company at the confluence of the Christina River and Brandywine Creek (the future site of Wilmington, Delaware). Both fortifications served as centers for fur trading, and Fort Christina also developed as an agricultural settlement. The New Sweden Company dispatched more than a dozen expeditions over the next decade bringing Swedes, Finns, Dutch, and German settlers to the Delaware, then known as the South River. 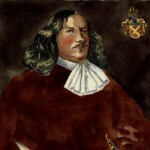 When Lieutenant Colonel Johan Bjornson Printz (1592-1663), a veteran of the Thirty Years War (1618-48), became governor of New Sweden in 1643 he further fortified the colony with Fort Nya Elfsborg (Elsinboro, Salem County, New Jersey) and Fort New Gothenburg (Tinicum Island, Pennsylvania) upriver on the west bank a mile south of Fort Nassau. The Dutch West India Company naturally responded to New Sweden’s threat to New Netherland’s commercial monopoly on the South River by strengthening Fort Nassau, building a number of small, fortified trading posts across the river, and erecting Fort Casimir where the river met the Delaware Bay (later the site of New Castle, Delaware). 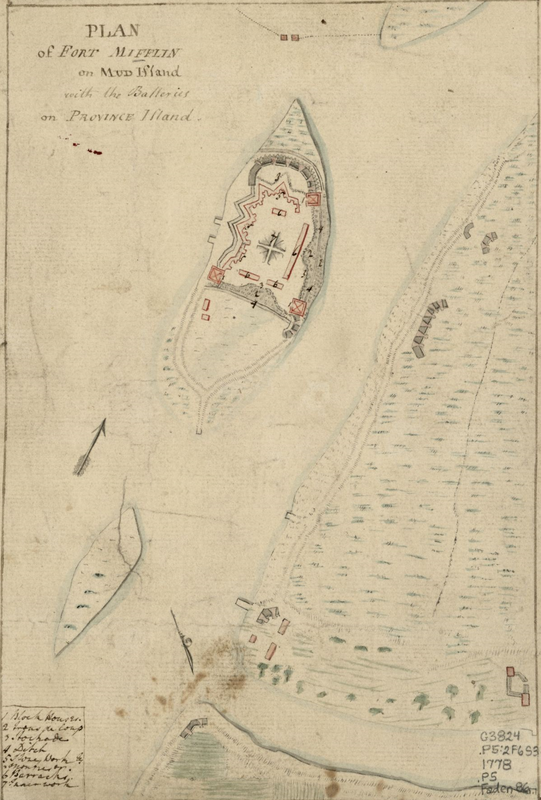 The new fort stood well below the Swedish forts and promised to stop Swedish ships entering the bay and river. New Sweden soon seized Fort Casimir, but had neither the resources nor manpower to construct and hold such a fort as aggressive New Netherland Director-General Peter Stuyvesant (1612-72) sent a thousand-man expedition up the Delaware in 1655 to retake the defensive works and bring an end to New Sweden. The regained Dutch influence on the Delaware River was short-lived. In 1664, after the Dutch surrendered New Netherland to the British, they quietly abandoned their forts on the Delaware. Without major threats to control over the region and naval supremacy in the bay and nearby Atlantic coast, the British decided not to garrison fortifications on the Delaware. Spending money on forts or defense also did not interest the Quaker provincial government of Pennsylvania, created by land grant to William Penn in 1681. By the mid-eighteenth century, though, the need for fortifications in the Delaware Valley increased as Britain became locked in a century of colonial warfare with France and Spain. Greater defenses became an issue by the 1740s as French soldiers and their Native American allies came south from Canada into western and central Pennsylvania to block English westward settlement, while French and Spanish naval forces—particularly privateers from the West Indies—came up the coast and plundered several Delaware Bay and river settlements. Local residents constructed a fortified redoubt in 1748 near Wilmington, but the Quaker assembly in Philadelphia refused to raise money for the city’s fortification. When the French and Spanish threatened Philadelphia’s trade and business, more-militant Quaker merchants joined with a non-Quaker political faction that included Benjamin Franklin (1706-90) to fund defensive measures. During King George’s War (1740-48), Franklin used the sale of lottery tickets to fund the construction in 1747-48 of the Grand (Association) Battery, a great twenty-seven-gun stone wall along the south Philadelphia (Southwark) riverfront, and a smaller Society Hill Battery just upriver. Fortifying the lower Delaware and Philadelphia became more urgent during the French and Indian War, 1754-63, particularly after the British were driven from Fort Duquesne in western Pennsylvania and moved eastward toward Philadelphia. In response, Franklin oversaw construction of a number of fortifications in the Lehigh Valley, where he personally directed the building of Fort Allen (Weissport, Carbon County) in 1755. The British government, overtaxed by continual warfare against the French in Europe, the Caribbean, Atlantic Ocean, and North America, expected the Pennsylvania Assembly to bear the burden of arming the Delaware Valley, particularly fortifying the Delaware River approaches to Philadelphia. To this end the British army dispatched military engineer Captain John Montresor (1736-99) to fortify Mud Island (also called Fort Island) on the Delaware riverfront near the mouth of the Schuylkill River. Montresor designed a small stone fort and began construction of a southern and eastern wall of the Mud Fort (later Fort Mifflin). Worsening relations between England and her North American colonies interrupted construction until 1775, as the Continental Congress met in Philadelphia and increasingly protested British taxation and trade policies. Months of debate over whether Pennsylvania, Philadelphia, or the Continental Congress, should select sites and pay for defensive works along the river reached a critical stage after the American Declaration of Independence. 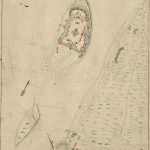 On July 5, 1776, the Continental Congress purchased a site for a fort in Billingsport (Paulsboro), New Jersey. General George Washington (1732-99) asked Col. Thaddeus Kosciuszko (1746-1817), a highly skilled French-trained Polish/Lithuanian military engineer to design the fort, and the Continental Congress hired French military engineer Philippe DuCoudray (1738-77) to build it as an anchor for a chain of frames of large iron-tipped logs known as cheveaux-de-frise to be spread across the river channels to prevent British warships coming upriver to attack Philadelphia. 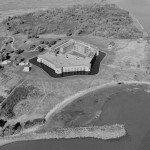 Congress also authorized construction of Fort Mercer on a high bluff known as Red Bank, Gloucester County, New Jersey. The British attack on Philadelphia in late summer and fall of 1777 forced completion and garrisoning of the three Delaware River forts. Fort Billings, defended by local militia, was the first to fall to the British Army, then British naval vessels breached the chevaux-de-frise and slowly moved upriver toward the Mud Island (Fort Mifflin) and Red Bank (Fort Mercer) fortifications. British naval bombardment of Fort Island, reportedly the heaviest cannon fire of the Revolutionary War, reduced the Mud Fort (Fort Mifflin) to rubble. Forts Mercer and Mifflin were abandoned on November 15, and the British Army occupied Philadelphia. The Revolutionary War marked the last time that forts in the Philadelphia region defended against an enemy force. Nevertheless, fortifications became important while Philadelphia served from 1790 until 1800 as the national capital. President Washington and his secretary of the treasury, Alexander Hamilton (1757-1804), pressed for rebuilding Fort Mifflin and constructing river defenses, particularly with the growing threat of French and British naval incursions in the Delaware during the wars of the French Revolution. The federal government hired civil engineer Major Pierre Charles L’Enfant (1754-1825) to redesign Fort Mifflin and military engineer Anne-Louis de Tousard (1749-1817) to build the bastion. Tousard used government funds to buy material from Philadelphia merchants and hire local German, Irish, and English carpenters and bricklayers. African American slaves, many owned by Tousard, supplied the necessary labor. The fort was named Fort Mifflin in 1795 after Washington’s wartime adjutant general, Thomas Mifflin (1744-1800) of Philadelphia. Work ceased on Fort Mifflin when the national capital left Philadelphia in 1800 for the Potomac River. Some construction resumed during the War of 1812, but Jeffersonian Republicans preferred to spend money on several temporary batteries of twenty-four-pounder cannon on islands in the Delaware River and use small gunboats to protect the city. Moreover, it seemed that the region should be defended with a fort farther downriver because Fort Mifflin stood too close to Philadelphia to provide adequate defense against increasingly long-range naval armament. The U.S. government began to look at sites near New Castle, Delaware, and Pea Patch Island, a large island in the middle of the Delaware River channel where the river met the bay. Work began on a Pea Patch Island fort soon after the War of 1812. Fire destroyed the partially built fort in 1831, but construction resumed in 1833 on a large stone fortification called Fort Delaware. Defense of the region became necessary once again with the advent of the Civil War. After the Confederate capture of Fort Sumter in the Charleston, South Carolina, harbor in 1861, the U.S. and Pennsylvania governments demanded the arming of Fort Delaware. They worried that a nearby secessionist movement in the state of Delaware and southern counties of New Jersey threatened the security of the cities of Philadelphia, Chester, and Wilmington, which were rapidly emerging as centers of munitions manufacturing, gun casting, and ironclad shipbuilding. The railroad system carrying troops and material south to meet the rebel forces also passed through these cities. Rumored construction of a huge Confederate Navy ironclad warship particularly disturbed the region, and Fort Delaware needed to mount heavy smoothbore guns and floating mines to stop enemy ironclads from attacking Philadelphia. The federal government began to build a great ten-gun battery on the Delaware City riverfront (Fort DuPont) to protect Pea Patch Island. Fort Delaware and to a lesser extent Fort Mifflin served as prisoner-of-war camps throughout the Civil War. Fort Delaware held more than 30,000 Confederate prisoners and local Southern sympathizers in the extremely unhealthy, disease-ridden Pea Patch Island facility. The last decades of the nineteenth century became the golden age of American coastal fort building as the United States entered into imperial rivalries with Germany, Russia, England, France, Japan, and particularly Spain, which seemed a threat to American interests in Cuba and the Philippine Islands. As the federal government moved to modernize and strengthen American seacoast defenses, the Philadelphia region gained additional fortification in 1896 with construction of a battery on Finn’s Point, Pennsville, Salem County, New Jersey. Named Fort Mott after New Jersey Civil War and National Guard commander Brigadier General Gershom Mott (1882-84), the new fort created a defensive triangle with Forts Delaware and DuPont to stop any enemy fleet before it could reach the great manufacturing centers upriver at Wilmington, Chester, and Philadelphia. Delaware Valley forts played no fighting role during the Spanish-American War, but U.S. entry into the First World War in 1917 brought the prospect of a greater need for defending the region as it continued to be a center for naval and merchant shipbuilding, munitions making, and other war goods. Moreover, the region became a mobilization nexus for troops to be shipped to the European fronts. Forts Mott and DuPont were garrisoned by artillery units. Fort DuPont built more barracks, a hospital, and warehouses to train and equip draftees and house troops and material destined to fight in the Great War. However, the region faced no real threat from enemy forces other than sabotage of defense industries by German agents in New Jersey. The threat to the region was greater by the time of the Second World War, when the Japanese attack on Pearl Harbor in December 1941 raised the possibility of long-distance aerial attack. Older, obsolete forts gained new purposes as sites for anti-aircraft batteries, including Fort Mifflin, manned by the first African American Coast Artillery unit. It soon became apparent, though, that the greatest threat to the region during the Second World War came from powerful German U-boats that torpedoed merchant ships and oil tankers off the Jersey and Delaware coasts and lurked just off the Delaware Bay and capes to intercept ships coming out of the Delaware Bay. In response, the United States moved all Delaware River and bay defenses to the seacoast, erecting Fort Miles on Cape Henlopen, near Lewes, Delaware. Fort Miles featured giant, long-range sixteen-inch guns and 90mm anti-aircraft batteries. Round concrete observation and fire-control towers were constructed along the Jersey coast as far north as Sandy Hook and down the Delaware coast to Ocean City, Maryland. Locating coastal defenses ever farther away from Philadelphia and the Delaware River during the Second World War attested to the increasing spatial dimensions of modern warfare and long-range capabilities of new weapons. It suggested as well the increasing obsolescence of the Greater Philadelphia region’s historic forts. All Delaware River forts were declared war surplus after the Second World War and remaining guns or other military material were removed. Forts Mott, DuPont, and Delaware were given to New Jersey and Delaware and became parts of historic districts and state park systems. Fort DuPont retained a National Guard armory. 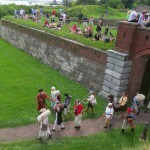 Fort Mifflin was eventually obtained by the city of Philadelphia and supported by a private Fort Mifflin Society to preserve one of the most historic forts in American history. The U.S. Army Corps of Engineers retained a presence on site. None of the early seventeenth-century forts remained, but plaques and monuments marked the original sites of Forts Elfsborg, Billings, Mercer, Casimir, and Christina. The surviving structures and monuments and plaques served as reminders of the central role forts played in the earliest history of the Greater Philadelphia area. Jeffery M. Dorwart, Professor Emeritus of History, Rutgers University, is the author of histories of the Philadelphia Navy Yard; Fort Mifflin of Philadelphia; Naval Air Station Wildwood; Camden and Cape May Counties, New Jersey; Office of Naval Intelligence; Ferdinand Eberstadt and James Forrestal. He also is the co-author of Elizabeth Haddon Estaugh: Building of the Quaker Community of Haddonfield, New Jersey, 1701-1762 (Historical Society of Haddonfield, 2013). Dorwart, Jeffery M. “Forgotten Victories: Red Bank, Fort Mercer and the Defense of the Lower Delaware,” New Jersey HERITAGE (Winter 2005): 28-37. _______. Fort Mifflin of Philadelphia: An Illustrated History. A Barra Foundation Book. Philadelphia: University of Pennsylvania Press, 1998. _______. Invasion and Insurrection: Security, Defense, and War in the Delaware Valley, 1621-1815. Newark, Del. : University of Delaware Press, 2008. Grant, Andres G. Fort Mott. Charleston, S.C.: Arcadia Publishing, 2013. Jackson, John W. The Pennsylvania Navy, 1775-1781: The Defense of the Delaware. New Brunswick, NJ: Rutgers University Press, 1974. Smith, Samuel Stelle. Fight for the Delaware, 1777. Monmouth Beach, N.J.: Philip Frenau Press, 1970. Stotz, Charles Morse. Outposts of the War for Empire: The French and English in Western Pennsylvania: Their Armies, Their Forts, Their People, 1749-1764. Pittsburgh: University of Pittsburgh Press for Historical Society of Western Pennsylvania, 1985. Temple Brian. The Union Prison at Fort Delaware: A Perfect Hell on Earth. Jefferson, N.C., and London: McFarland & Company, 2003. American State Papers: documents, legislative and executive of the Congress of the United States in relation to the public lands, 1789-1838. 5 vols. Washington: Duff Green, 1834. Lewis, Emanuel Raymond. 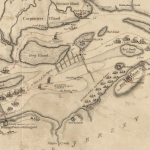 Seacoast Fortifications of the United States: An Introductory History. Annapolis: U.S. Naval Institute Press, 1993. Snyder, Frank E. and Brian H. Guss. The District: A History of the Philadelphia District U.S, Army Corps of Engineers 1866-1971. Philadelphia, 1974. Fort Allen Well, 112 Franklin Street Rear, Weissport, Pa.
Fort Billings Park, Delaware Avenue, Paulsboro, N.J.
Fort Delaware State Park, ferry boat to Pea Patch Island from Delaware City, New Castle County, Del. Fort DuPont, State Park, Delaware City, Del. Fort Mercer (Red Bank Battlefield and Whitall House), 100 Hessian Avenue, National Park. Gloucester County, N.J.
Fort Mifflin, Hog Island Road, Philadelphia. 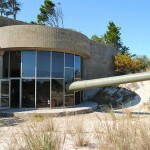 Fort Miles, Cape Henlopen State Park, Lewes, Del. Fort Mott State Park, Pennsville, N.J.
Grand (Association) Battery historical marker, Columbus Boulevard and Washington Avenue, Philadelphia. This is an excellent essay with wonderful images and maps. It would be most welcome to add that the strengthening of the fortifications in War of 1812 was done primarily by black Philadelphians answering the call of James Forten, Richard Allen, et al.